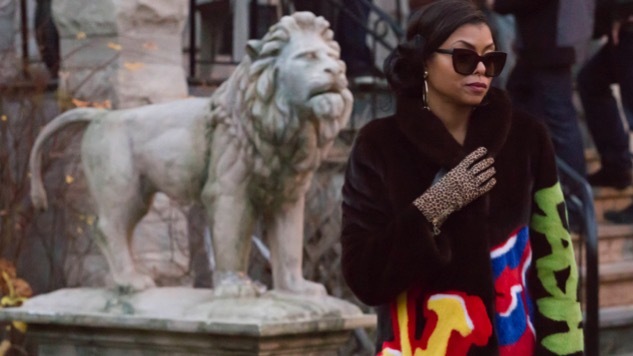 The 5 Most Outrageous Things From Last Night's Empire, "The Tameness of a Wolf"
Give credit where credit is due: this was the least outrageous episode of Empire yet. Outside of a stray few moments that went delectably over-the-top, this was a relatively reserved installment of the show. The hour centered in on the ghosts of the past and the long-lasting scars that families can sometimes leave on their children. When Hakeem looked positively crestfallen that he didn’t receive the support that Laura’s family exhibits, it was actually affecting. And Bryshere Grey showed off some admirable acting chops, with the expression of a wounded child washing over his features. That proved a perfect parallel to Lucious’s ordeal of digging into his harrowing past for moments to place in his new music video. Terrence Howard often opts to ham it up for the sake of this glitzy drama, but he went deep in his early scenes. He was pulling from some awful memories of his own, or at least tapped into something truly magical to prove himself that vulnerable. Now Cookie knows that the young hip-hop protege that her ex-husband brought on board is the daughter of Frank Gathers, the drug dealer that Lucious had killed in prison. The look on her face when she put it all together was almost maniacal—and a huge overreaction to something that feels relatively minor. The clip from next week’s episode showed Cookie exclaiming that she doesn’t want that dangerous girl near her precious children, which I suppose could be an issue. But nothing that Freda has done has really proven her to be a threat to anyone but Lucious. So ease up on the gas pedal there, Cook, and give the young lady a chance. Can someone get this dude to a therapist already? Instead of taking some solace in the fact that there’s a genetic source for his bipolar issues, dude wigs out on his dad. And Lucious responds in typical dickish fashion. It was all built up throughout the whole episode that the former Empire CEO was going to take out his anger at his mom on his eldest son, so it was really no surprise. Yet watching those two get nose-to-nose and start damning the other to hell was one of the more unintentionally funny moments of this week’s show. Cookie’s best line was that one, spoken as she walks into Lucious’s palatial estate and sees that the only gift she was to receive on her birthday was a teddy bear holding a batch of vinyl balloons. It was the most intentionally funny moment in the show and my favorite bit of dialogue on the series for some time. Where you been, girl? This show needs a serious injection of crazy right now and I think you’re the person to bring it. It looks like she and Rhonda are joining forces (at least that’s what they showed in the sneak preview for next week’s episode), but to what end? Lesbian love affair? A coup d’etat started from within Empire’s fashion offshoot? The mind reels at the possibilities, and gets me even more excited for the weeks ahead. Somehow this product tie-in slipped under my radar. It’s not a bad one either. A little easier to understand than Jamal Lyon’s big soda pop campaign. This at least has the intended effect of making the women of the world feel as fierce as Cookie and as sassy as Becky and as evil as Anika. And if it puts Gabourey Sidibe in a big cosmetics ad, that’s a victory for everyone. Still, it feels pretty outrageous to find the world’s brands trying to leech off the success of this. It hasn’t gotten too bad yet, but as soon as Burger King starts offering drinking glasses with the faces of the main characters screenprinted on them, then we’ll know desperation has really set in for Empire.